Looking for some simple sides this Christmas? 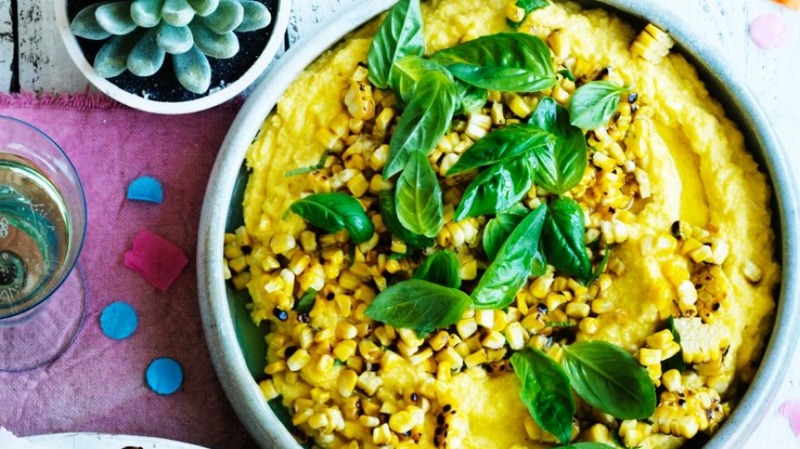 Pair this sweet and creamy corn dish with tomatoes sliced and dressed with olive oil and a good balsamic or red wine vinegar and a beautiful green salad with a simple garlic, olive oil and lemon dressing. 1. Steam seven cobs of the corn for six minutes or until cooked. 2. Peel husks and grill on a barbecue until the outside of the corn has become charred, then set aside for later. 3. With the remaining corn, remove the kernels from the cob to be sauteed later. 4. Saute the onion and garlic in the butter until soft. Then add the kernels of corn and continue to cook until the corn changes colour from pale yellow to deep yellow. 5. Add the water and cook for a further 10 minutes on low until the corn has softened fully. 6. Transfer the corn mix to a blender and blend until as smooth as possible. Do not overcrowd the blender. Do this in small batches if your blender struggles to make it smooth. 7. Remove charred corn kernels from the cobs. Mix with the corn puree. Season well. 8. To serve, heat the corn, fold through the parmesan and basil and spoon on to the plate with the butterflied roast turkey.